WEST LAFAYETTE, Ind. - Neil Armstrong, the first human to set foot on the moon and a Purdue University aeronautical engineering alumnus died Saturday (Aug. 25). 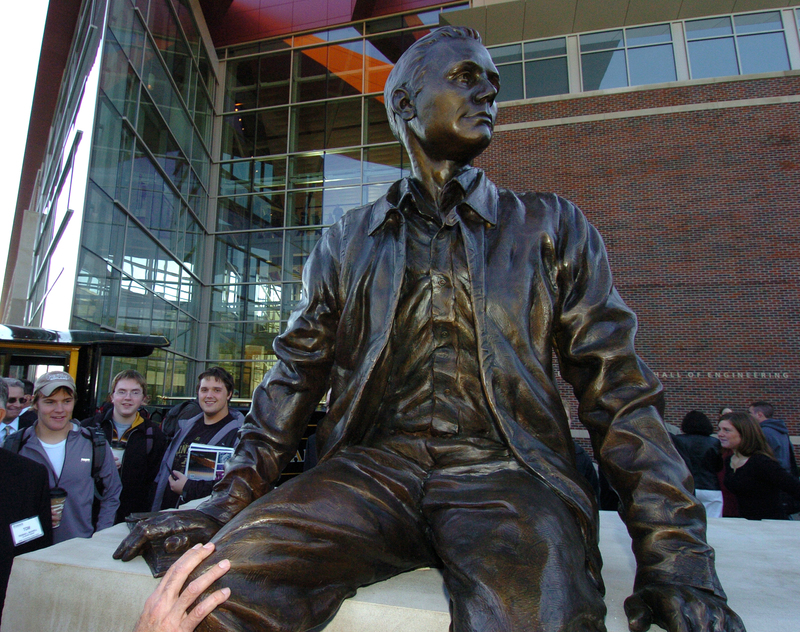 "Neil Armstrong is likely the most famous and inspirational alumnus Purdue has ever had, and he has been an integral part of campus life from his arrival as a young student in the '50s to today. This is a sad day for all of Purdue," said Tim Sands, the university's acting president. "He was a humble and private person, but always willing to talk to students. He was passionate about encouraging young men and women to pursue careers in science and engineering." Sands asked that Purdue University flags on campus be flown at half-staff in recognition of Armstrong. Armstrong earned a bachelor's degree from Purdue in aeronautical engineering in 1955 and was awarded an honorary doctorate in engineering from Purdue in 1970. On July 20, 1969, Armstrong became the first person to walk on the moon as commander of Apollo 11. Armstrong was a long-time supporter of Purdue, serving as co-chair of a major fundraising campaign with fellow astronaut and Purdue alum Eugene Cernan, the last to set foot on the moon. Armstrong made many public appearances at the university and lent his name to the Neil Armstrong Hall of Engineering. A statue of Armstrong as a young student and a replica of his footprints on the moon grace the entrance. The footprints show how far Armstrong could step in the low lunar gravity. "The Purdue community joins the nation in mourning the passing of a great American," said Keith Krach, chairman of the university's Board of Trustees. "Armstrong Hall, which bears his name, serves as a reminder of his contributions, not only to his alma mater, but also to the nation and the world. His legacy will inspire generations to come." Armstrong donated his papers to Purdue in 2008. The archive also contains 55 hours of one-on-one tape-recorded interviews conducted by authorized Armstrong biographer James R. Hansen. Hansen's book, "First Man: The Life of Neil A. Armstrong," spent three weeks on The New York Times Best Sellers list. Armstrong was an ardent football fan, citing that as one of the reasons he selected Purdue. He played the baritone horn in the Purdue "All-American" Marching Band in 1952, He returned years later for several halftime events at Ross-Ade Stadium, where he was honored with an invitation to beat Purdue's World's Largest Drum and wave the university flag during the fourth quarter of a Boilermaker football game.